It’s official: the UK is a nation that has fully embraced the online video revolution and places YouTubers as the most trusted source of information when they’re looking for products or services online. Results are in of our Online Video Barometer, conducted independently by OnePoll, and they show a staggering consumer affiliation to YouTubers with nearly half of all respondents citing an online video review as the most trusted source of information over any other medium. Its closest rival was a magazine review at 23%, with TV garnering just 14% and radio 2% of the votes. It has also been revealed that nearly half of all respondents turn to online video to find out how to do something in their daily lives. Time spent consuming online video is fast on the increase. Nearly a quarter of all respondents (22%) watched between 6 and 10 hours of online video every week, with 37% watching between 2 and 5 hours a week; a high percentage of these users of whom are likely to shift to the 6-10 hour usage levels during 2015. The average of 5 hours per week of online video watched in the first half of 2014 as reported by IAB* has already increased to 6 hours according to the BuzzMyVideos Online Video Barometer and this is set to soar in the next 12 months. With such high trust placed in online videos, it therefore comes as no surprise that 93% of respondents had positive feelings towards any products or services featured in a video and 89% more likely to buy after seeing a good review. Nearly half of respondents would be more likely to investigate a product, brand or service seen in a video with 59% of 35-45 year olds surveyed saying they are either neutral or more likely to investigate what they have seen. What do our video choices say about the UK as a nation? We analysed the kinds of videos that people in the UK most like to watch; Music and Comedy reign supreme, but we like to stay up to date with beauty trends and are keen to find out how stuff works. Comedy garnered almost a third of all responses at 32% followed by music at 27% have emerged as the most popular videos of choice for us Brits. And if we’re not laughing or singing, we’re making life better with 20% of respondents citing beauty and how to videos as their next port of call online. Interestingly, women were more likely to search for music (29%) whereas over a third of men preferred a laugh, opting for comedy (35%). For those interested in regional differences, overwhelmingly the North East of the UK opted for music 44%, but anyone looking for the next rising comedy star should head to the East Midlands where half of all respondents watch comedy videos. Is Online video enhancing our lives? Respondents were asked how often they used online video for learning how to do something in their daily lives. The results highlight that the learning aspect of online video featured heavily in all age groups’ responses, revealing the huge connection and desire to learn consumers have when engaging with video. Over a quarter of all 16-45 year olds said they used online video for working out how to do things a few times every week, with nearly half (41%) in total responding that they check online videos at least once a week (10% daily). 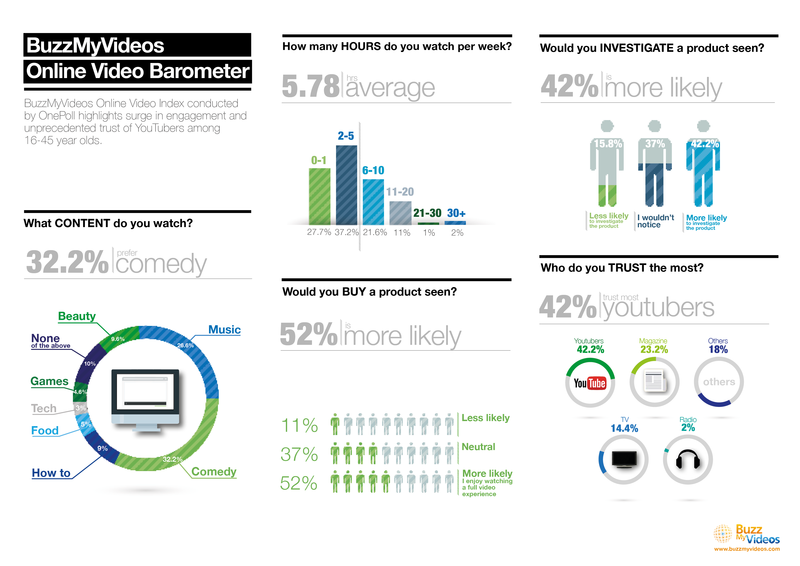 Our Online Video Barometer has revealed that an overwhelming 87% of respondents still opt to view their videos on YouTube, despite advances by other platforms for now YouTube remains the dominant force. However Facebook is clearly catching up with consumers; nearly half of all those surveyed (45%) cited the social network as a source for their unabated video appetites with other publishing platforms garnering just 17% of the vote. To find out about how BuzzMyVideos can help your brand work with YouTube creators to reach audiences and consumers, contact us here.